afrol News, 24 March - German President Johannes Rau today cancelled an official visit to Djibouti, where he was to greet German anti-terrorism troops, after plans of his assassination were uncovered. German intelligence had observed the preparations by Islamist militants in Djibouti to attack the President. Mr Rau was to visit the German troops in Djibouti and Djiboutian President Ismail Omar Guelleh as part of his Africa roundtrip. The German President had visited Nigeria earlier this month and is now in Tanzania, from where he was to pass through Djibouti on his way back to Berlin today. In a last minute decision made last night, President Rau decided to cancel the stop-over in Djibouti to avoid exposing himself to the assumed terrorist threat. Mr Rau had been "urged" to cancel the Djibouti visit by German intelligence services, fearing that an allegedly planned attack on the President's life could be successful. President Rau in Dar es Salaam expressed frustration over the need to let "terrorists" influence his travel plans and said this would not be repeated in the future. "I had to be convinced that sticking to the travel programme under these conditions and at this particular location would have put the lives of many persons in significant danger," Mr Rau explained. The German Presidency this night revealed that German government and intelligence representatives had assessed "the existent indications of a terrorism attack as being serious." One had received information of an imminent attack of a leader of "a Western state," which German intelligence held to be Mr Rau. German intelligence therefore urged President Rau to cancel his Djibouti visit. Not only would the visit endanger the President's life, but the supposed terrorism attack could also pose a threat to the German soldiers deployed in Djibouti as part of the anti-terrorism operation "Enduring Freedom". Djibouti has developed into the operation central of the military anti-terrorism alliance in eastern Africa. The small Muslim state strategically located at the mouth of the Red Sea, hosts a US military base with an estimated 1,800 soldiers. Further participating in the Djibouti-based anti-terrorism military operations are some 2,700 French troops and 800 German and 50 Spanish troops. At the US military base at Djibouti's ex-French post Camp Lemonier, "the quiet battle" in the war against terrorism is waged by a new US military anti-terrorism taskforce. The Djibouti base, according to US media, is turning into the most strategic cell in the US-led war against Islamist terrorists and alleged terrorists. From Djibouti's Camp Lemonier, the international anti-terrorism taskforce coordinates its intelligence works in the Horn of Africa, East Africa and parts of the Arabian Peninsula. From the regional headquarters in Djibouti, anti-terrorism operations are planned in countries such as Somalia, Yemen, Kenya and Ethiopia. Germany, which risked its traditional friendship with the US by condemning the invasion of Iraq, has since the 11 September terrorism attacks been a key ally of the anti-terrorism coalition. Under the "Enduring Freedom" operation, Berlin has one of the largest NATO contingents in Afghanistan and has additional troops in Djibouti, Kenya, Kuwait, Uzbekistan, offshore Somalia and in several other hotspots around the world. 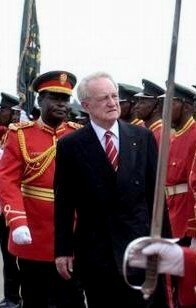 President Rau was to make the first-ever official visit by a German Head of State in Djibouti. His agenda included visiting the German troops stationed in Djibouti and on the frigate 'Augsburg', but also to hold talks with President Guelleh. The two Presidents were to discuss development issues and proceedings in the "war on terror". While located in an unstable region, Djibouti so far has avoided large-scale terrorism attacks. Further, none of the leading Islamist terrorist so far caught in the "war on terror" has been know to have a Djiboutian nationality.